Since 1994 our company has been using state-of-the-art telecom technologies and upgraded software environments to design, develop and operate advanced Internet systems that integrate securely Internet of Things components (IoT) with Cloud Computing services. ergSight® is an internet service developed by Online Services Ltd. that continuously monitors energy consumers (buildings, heat pumps, industrial plants, homes, etc.) to provide information on how they use energy sources. Most of the data are collected using IoT devices connected with dedicated ergSight® gateways which are connected securely with data center. Data center analyses and exposes data to the authenticated users. Users have access from any mobile device via personalized web interfaces to consumption diagrams, alert parameters (e.g. consumption level or time interval) or to remote control devices (e.g. light, heat, doors). In the side image, the diagram highlights energy consumption for an office building over a three-week period. It is easy to see that the energy consumption is very high in some nights. These anomalies may indicate the indiscipline of employees, defects in the heating system of the building, etc. 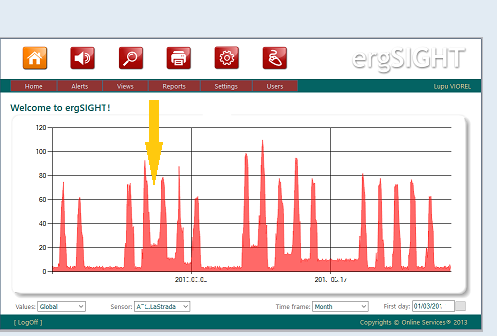 ergSight® continuous monitoring systems help at least to estimate energy costs, identify failures and develop energy efficiency policies. They are useful tools for energy audit. 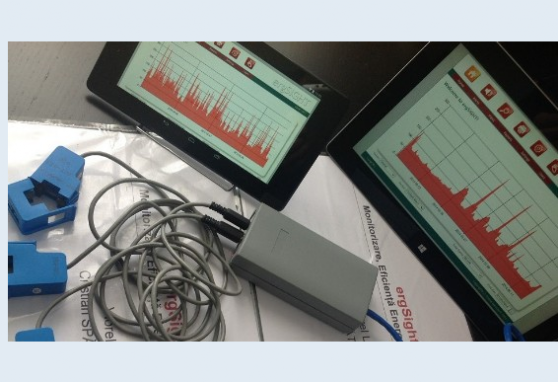 ergSight® systems have provided data for a research work named Cloud computing and continuous energy consumption monitoring by Viorel Lupu, published by IEEE on 5th of February 2018. This paper may be dowloaded here. Online Services® Ltd. is a private company founded in 1994, registered in the Romanian Trade Register under number J10/523/1994. The main activity is to develop custom software and systems, as well as research and development in natural sciences and engineering. Our software systems are built by integrating components in various developent languages (e.g. SQL, C#, Java, C++, ASM, HTML, XML), various operating systems (Linux, Windows, IOS, Android) and hardware components from embeded low power systems to powerfull servers. Collaboration between partners is the key to success. Modern systems operated over the modern Internet public networks are so complex that the competence of a medium-small company is just a part of the whole picture. Online Services Ltd. company specializes in designing, developing and collaborating with contractual partners to implement and operate required Internet systems.